Although initially designed to be a pet, this Kreature excels in both stealth combat and pest control. 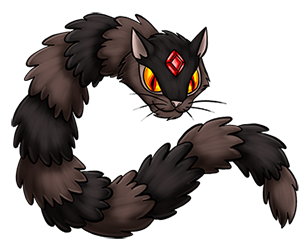 It can retract its limbs into pockets in its body so it can slither into burrows and other tight places; its fur has a special dirt repelling layer to keep it from getting matted. It uses the gem on its forehead to generate electricity, which it can project this through its claws to fry its prey from the inside out. However, sometimes it will merely stun its quarry so it can toy with it further. It sleeps for up to 19 hours a day, during which it has pleasant dreams of spilling the blood of its victims.